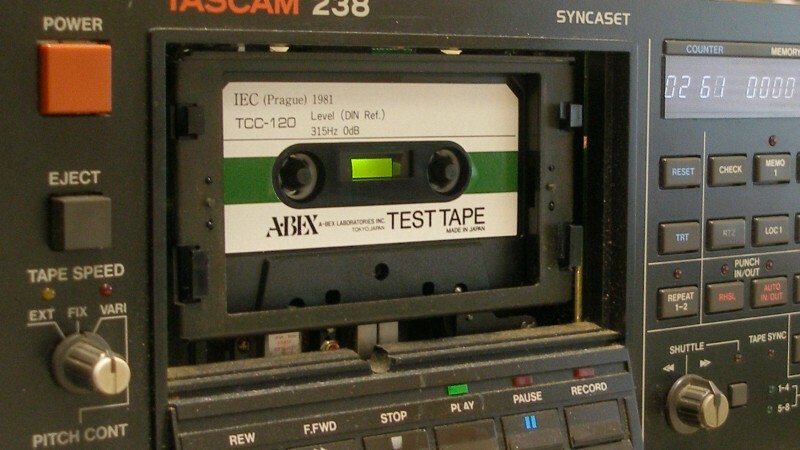 Tascam developed and sold a range of multitrack cassette recorders over the years and had a variety of recording speeds and noise reduction formats. 4 track cassette at standard speed using Dolby B, C or dbx noise reduction. 4 track cassette at double speed using Dolby B, C or dbx noise reduction. 8 track cassette at double speed using dbx or Dolby S noise reduction. Many happy hours have been spent using 4 track cassette machines such as the Tascam 244 to record music over the years. These machines were robust but are now over 20 years old. Cassette tape can still sound good after a long time if stored correctly and transferred with serviced and calibrated tape machines. We use the Tascam 234 rack version of their multitrack for transfers with dbx noise reduction if necessary. This is robust and much easier to work on than the smaller cassette multitrack machines with their built in mixers. The Tascam 238 was a multitrack track machine that managed to squeeze 8 tracks from the 3.81mm (0.15 inch) compact cassette tape width. Quality was pretty good due to the fast recording speed of 3.75 inches pre second (ips) or 9.5 cm/s which is twice the normal cassette deck speed. The 238 had DBX and the 238S had Dolby S noise reduction that helped to improve the signal to noise ratio. In addition to the mechanical problems of wear that affect the tape transport the direct drive capstan motor circuit board can start to fail causing the tape speed to increase wildly. While these can sometimes be repaired by replacing the capacitors we replaced the whole board and motor, apparently the last one available from Teac UK! The TEAC Portastudio 144 was the world’s first four-track recorder based on a standard compact audio cassette tape. It hit the markets in 1979, followed by the Portastudio One in 1984. For many amateur and do it yourself musicians the four track recorder was a liberatory tool. It enabled them to cheaply record several instrumental and vocal parts on different tracks in the comfort of their own home, rather than use an expensive recording studio. Many recordings we have access to today would have never been possible without the 4 track recorder – they were an essential part of the do it yourself recording revolution in the late 70s and early 80s. Portastudios were also used by mainstream artists to record demos (the whole of Bruce Springstreen’s sixth album Nebraska was recorded on a four track tape recorder). On four track recorders you could record more than four tracks via ‘track bouncing’. This method has been tried out previously on open reel multi-track recorders, most notably on the recording of The Beatles’ Sergeant Pepper’s Lonely Heart Club Band. Bouncing was a multi-track phenomenon whereby you can combine any two or more recorded tracks onto an unused track, thereby freeing up the original tracks for re-recording. So on a four-track, you might bounce, say, three tracks to one, leaving you three potentially open tracks, or three tracks to two—a stereo pair—leaving you two available tracks to record to. Four track recorders were followed later by models which could record up to 8 tracks of music. Multi-track recorders are still popular today, but record to hard disc or an SD-card, rather than analogue tape.